All documents reproduced by kind permission of the author. May be downloaded where links are provided. 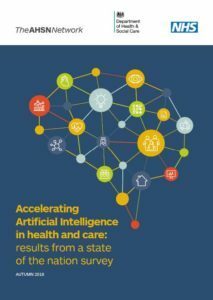 A 2018 ‘state of the nation’ report about the use of Artificial Intelligence in Health and Social Care has found that we are only beginning to unlock the potential of AI. This report spotlights some of the opportunities AI creates and shows where it is already being used in projects across the country. It also considers some of the barriers to wider deployment of AI and proposes solutions, including the creation of a ‘code of conduct’ for the sector.